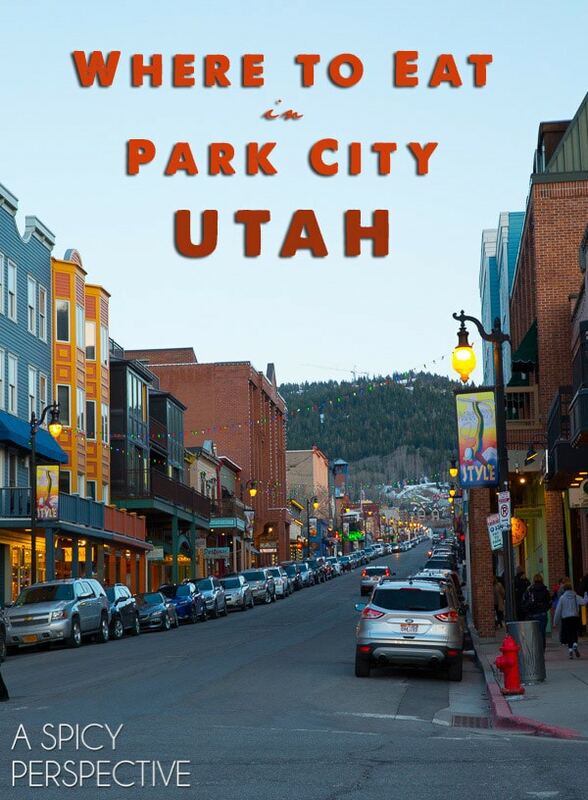 We recently visited Park City, Utah for spring skiing. 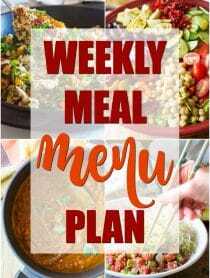 We ate like kings (and queens) the entire week! 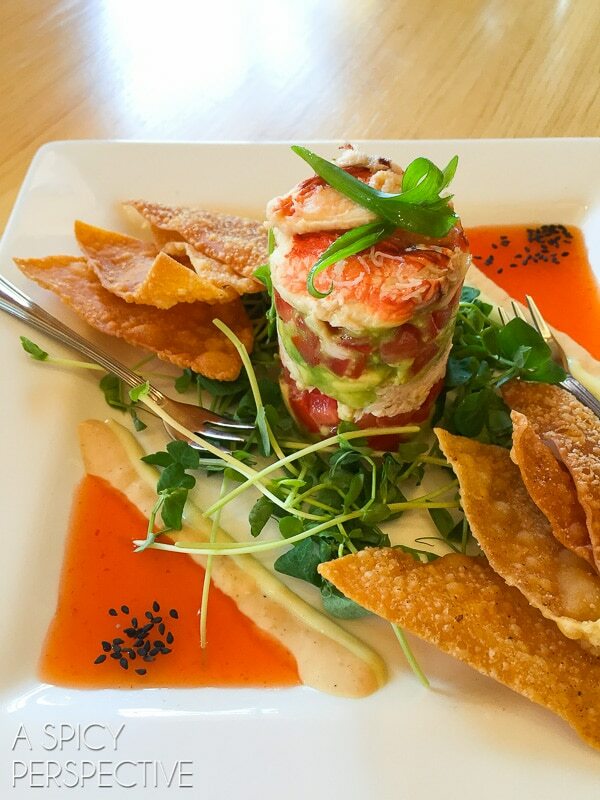 So today we’re sharing some of the Best Restaurants in Park City, Utah. 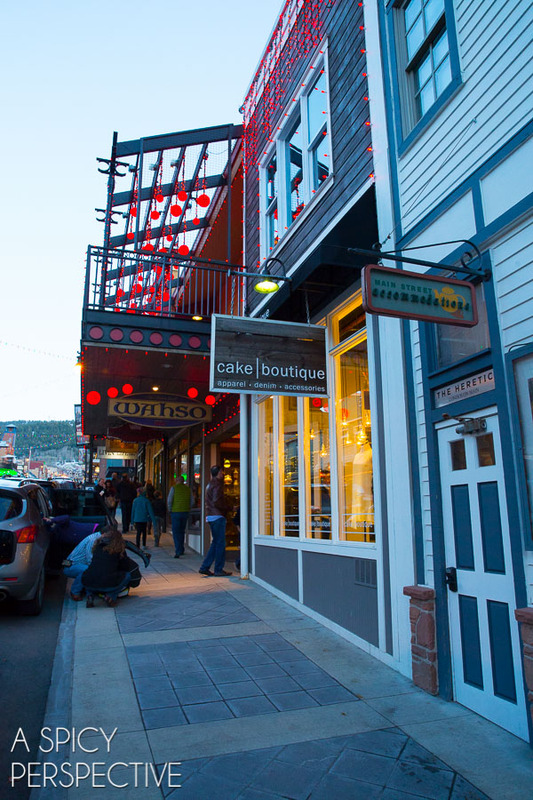 Park City, Utah is a cozy, yet exciting, place to visit year round. It has an eclectic welcoming feel, that attracts adventurers of all kinds… Those that love to ski and mountain bike. Those that love to visit spas and art galleries. 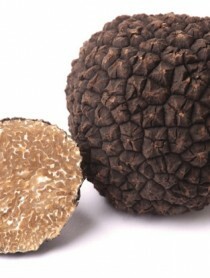 And those like have a thrill-seeking palate! Because it’s a popular tourism destination, restaurants in Park City, Utah can run a tad on the pricey side. However, most of the meals we enjoyed were extremely memorable and made for the experiential diner. 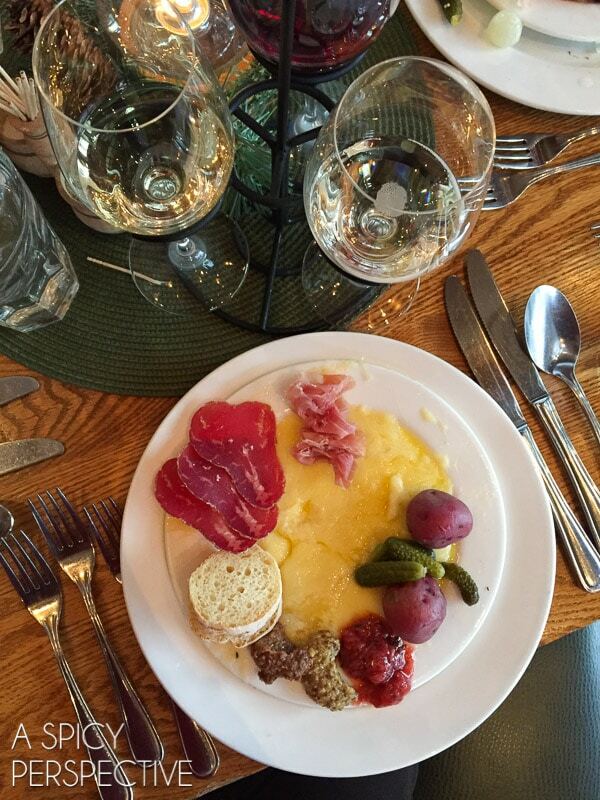 Dining in Park City is worth the splurge. 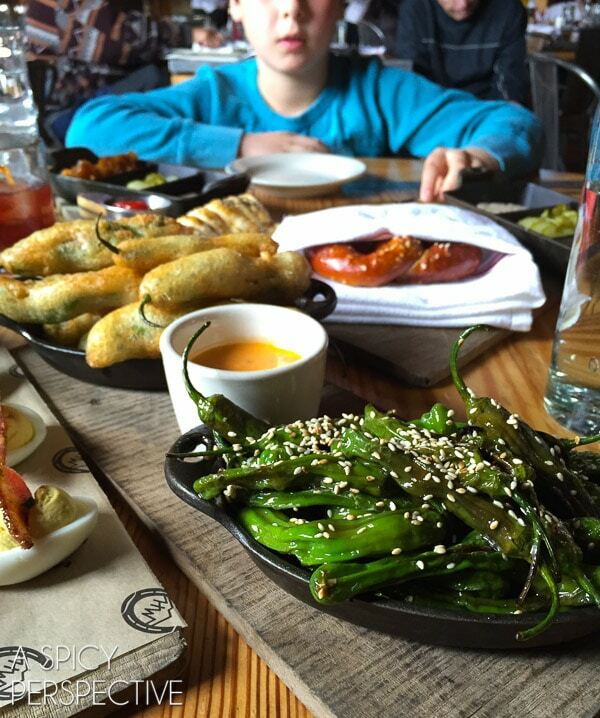 We noticed all the restaurants in Park City, Utah, that we visited, were openly kid-friendly. Even the most luxurious restaurants had little people tucked around the tables. You may not find the typical children’s menu of grilled cheese sandwiches and chicken fingers at all Park City restaurants. 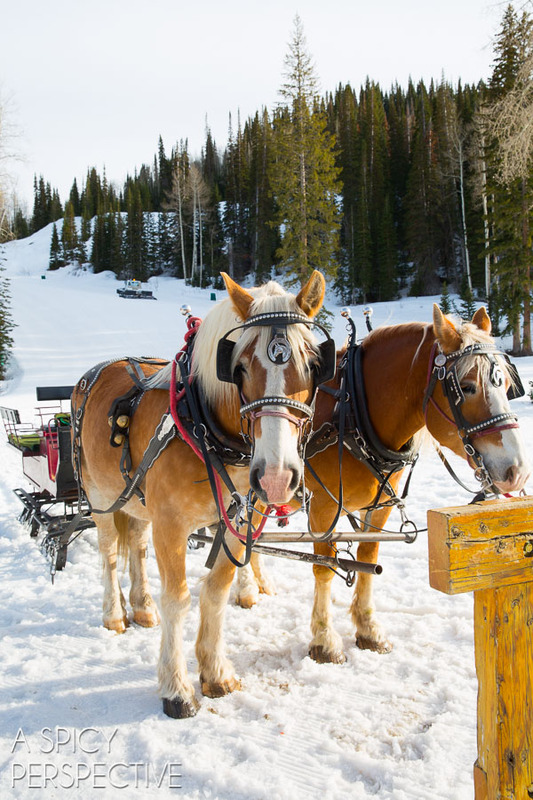 Yet, if you’re raising your babies to be as adventurous as you are, they are welcome to partake of Park City’s bounty. 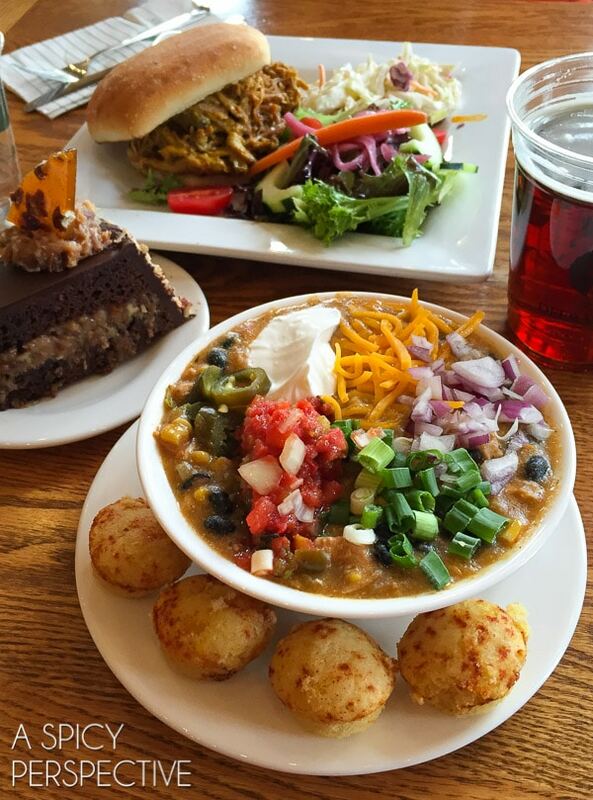 We had the opportunity to eat at all three ski resorts, as well as several restaurants in old-town Park City. With so many unique dining experiences, it’s hard to pick a favorite. Instead, let me tell you the highlights of each. 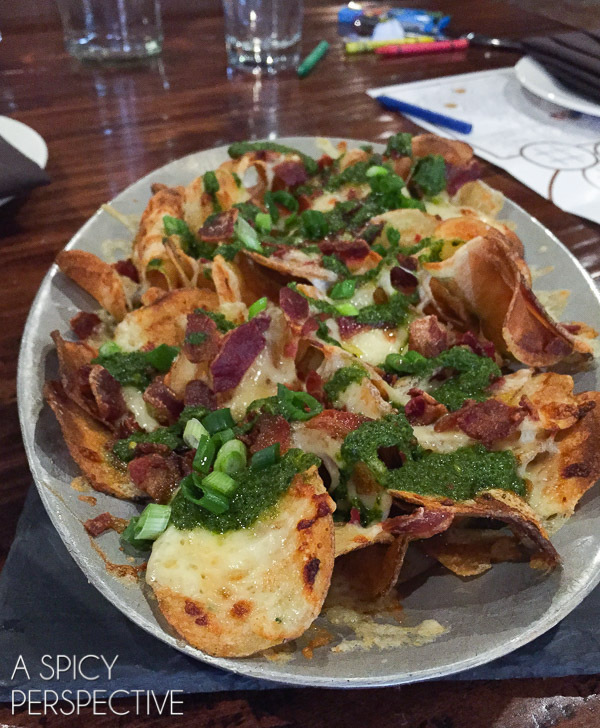 Brass Tag – Is the newest restaurant in the Lodges at Deer Valley. (Where we stayed.) 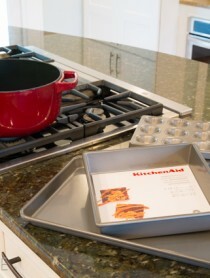 Brass Tag’s rustic dishes are prepared in a unique brick oven. Imagine, the best burger in town coming out of a brick oven! We also love the bone-in pork chops and oven fired chimichurri potato chips. 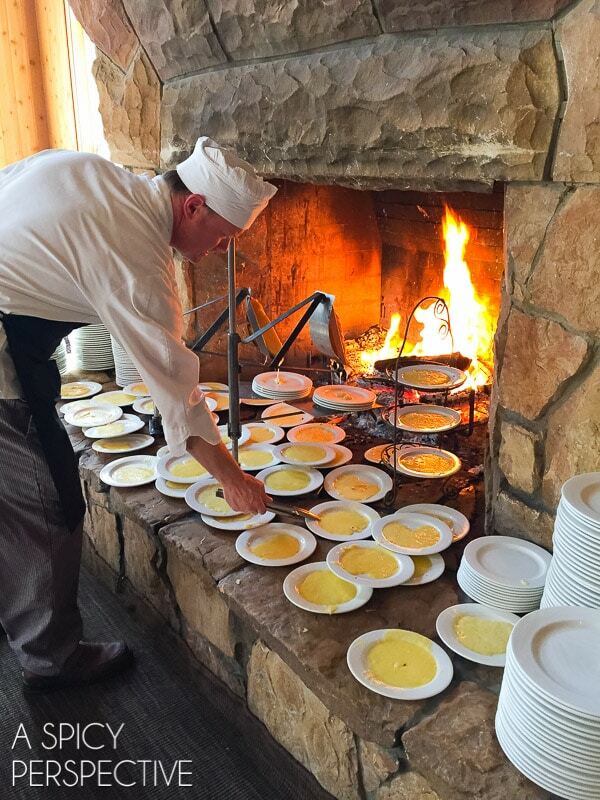 Deer Valley’s Fireside Dining – Located at Deer Valley’s Empire Canyon Lodge, Fireside Dining is a rusticly luxurious meal to remember! 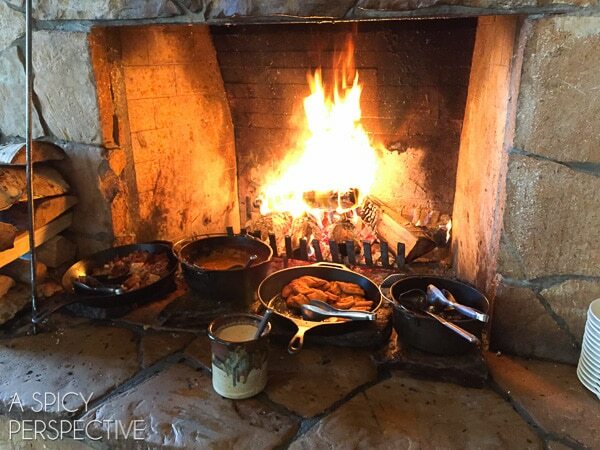 Fireside Dining is a fixed price dinner experience in which various courses are prepared over grand fire places. 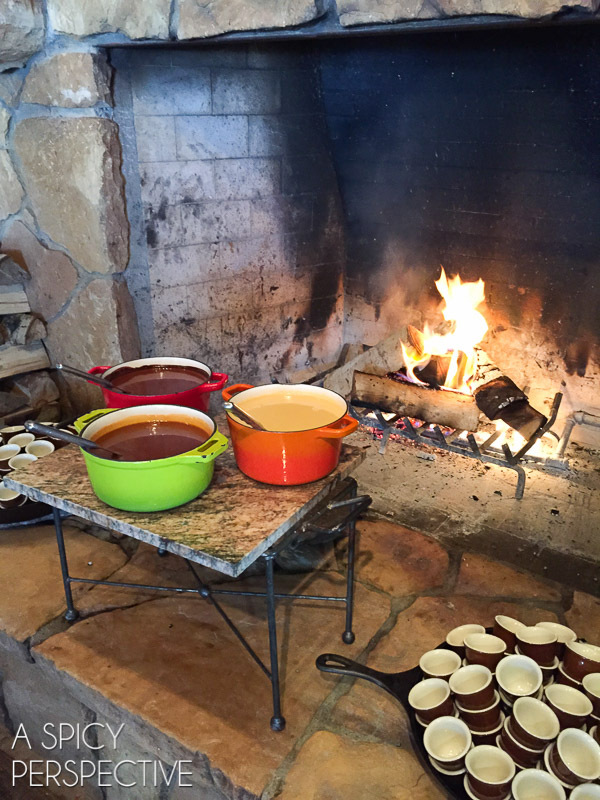 Take the sleigh ride before dinner, then come inside and warm yourself with fire-melted cheese fondue, roasted lamb, and liquid chocolate. Heaven! Royal Street Café – Hop off the slopes (or drive into Silver Lake Village) to enjoy a diverse menu of healthy favorites, seafood options and comfort food. We loved the Fresh Dungeness Crab Tower, Deer Valley’s fresh made cheeses, and RSC BBQ Sampler. Deer Valley Grocery Café – Right at the base of Snow Park Village, the Grocery Cafe is a fantastic place to get a fresh-made breakfast, lunch, or early dinner. When the weather is nice, sit out on the deck overlooking the pond and mountains. Grocery Cafe is an affordable dining option that does not disappoint. Legend’s Bar & Grill – Located in Legacy Lodge, Legend’s is the best sit-down restaurant option at Park City Mountain Resort. (Most of the others are cafeteria-style restaurants, meant to help you get a quick meal and get back on the slopes.) 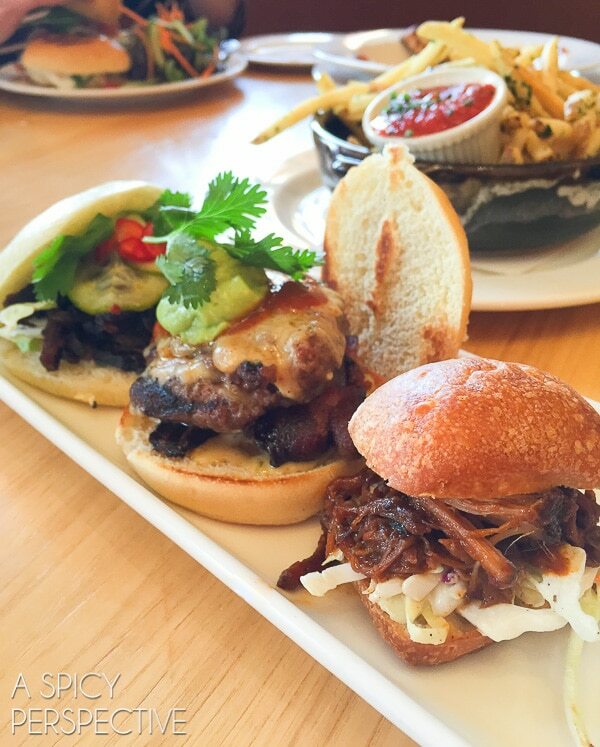 Legend’s offers great burgers and salads. 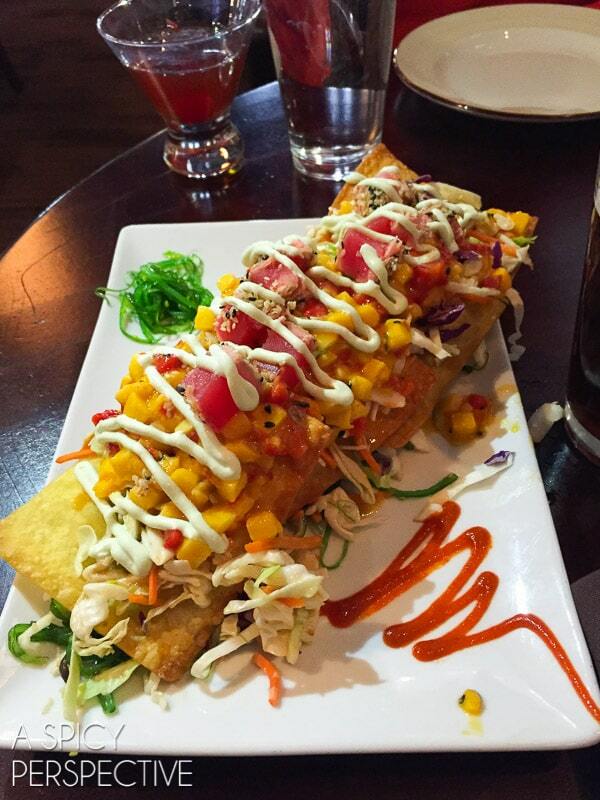 Yet the Seared Ahi Nachos are what really blew our minds… I’ll be making a copycat version of this very soon! The Farm Restaurant – Right at the base of Canyons Resort, The Farm Restaurant was one of the most memorable meals we experienced. Enjoy a casual, yet elegant setting, and classic farm-to-table American cuisine with a twist. We were crazy over the fried chicken sandwich, the brisket sandwich, the stuffed “Farm Potato” and their creative salad options. 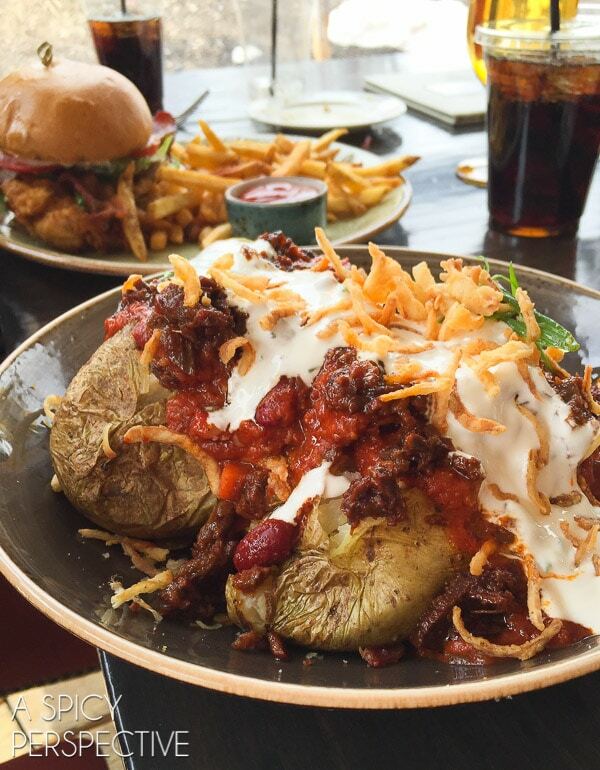 The Farm Restaurant was mentioned in Salt Lake City Magazine as one of the Top 25 Restaurants in all of Utah. If you aren’t staying at the ski resorts, no worries! All of these restaurants are accessible to drivers. 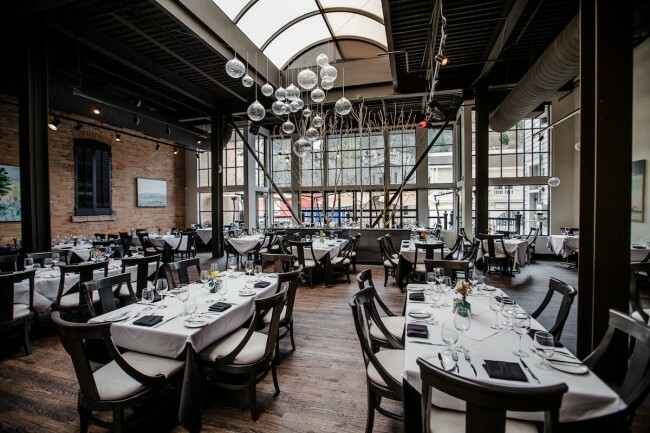 Riverhorse on Main – Upscale and modern Americana cuisine in the heart of downtown Park City (Old Town Main Street.) 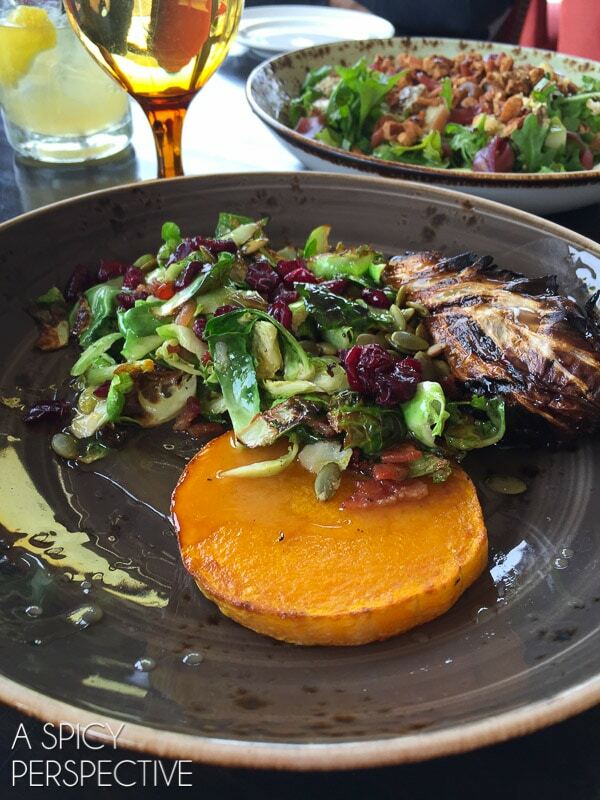 Riverhorse offers some amazing vegetarian options, as well as regional favorites. Plus, I believe I had the best Moscow Mule ever at Riverhorse! 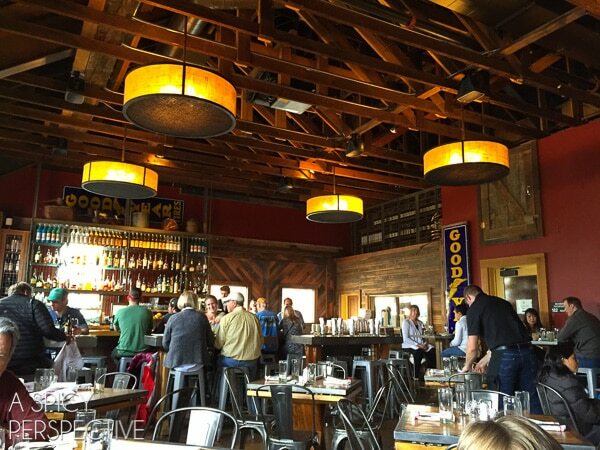 High West Saloon – Definitely one of our top picks in Park City, the name says it all. 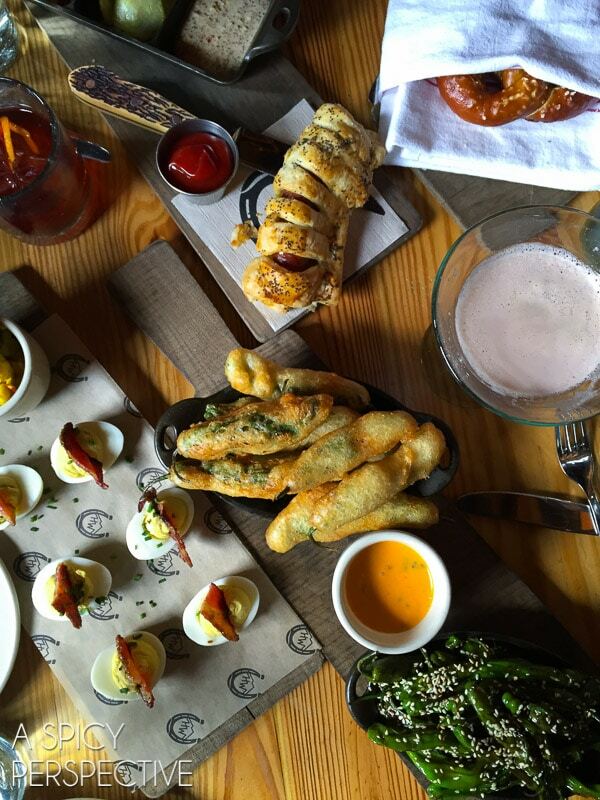 High West Saloon brews up some killer whiskey, and serves pub food with distinction. We visited at lunch and ordered all the small plates. (Because that’s how we roll.) The Shishito pepper small plate is something I still think about daily. Vinto’s Pizza – If you just want a pizza after a long day of skiing, Vinto’s is the place to go. Thin wood fired pizzas, cozy pasta dishes, and great salads. 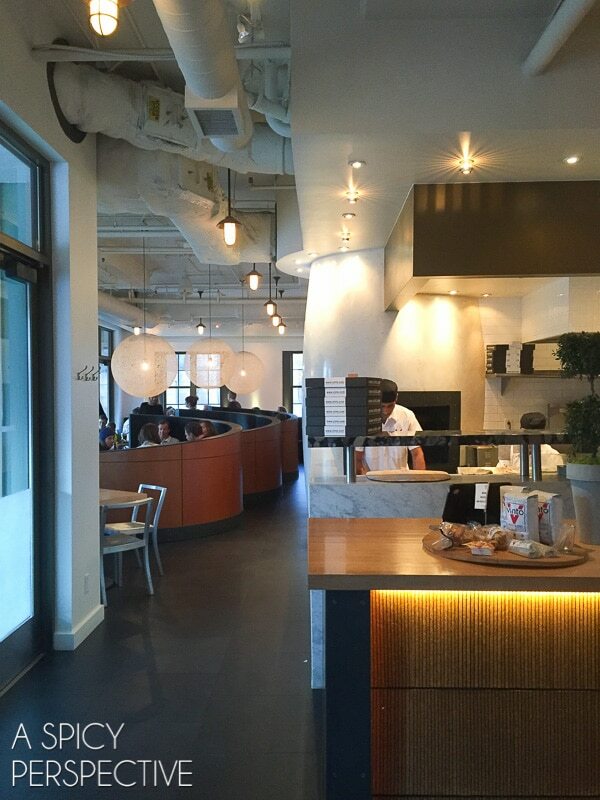 Vinto’s is affordable, family-friendly, clean and modern. Make sure to save room for thier homemade gelato at the end! 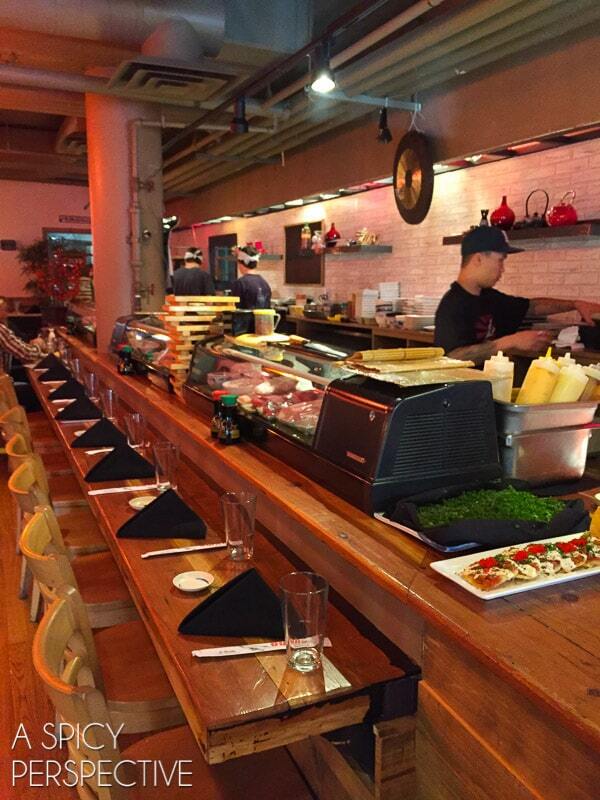 The Flying Sumo – A funky little sushi bar in old town Park City. Check out Flying Sumo’s unique sushi rolls, tempera shishito peppers, and smoke squid salad. The Chuck Norris Roll is the best! Zoom – It’s a known fact that Robert Redford doesn’t do anything half-way. At his signature restaurant Zoom, you will find intriguing regional cuisine, a well-rounded wine list, and a comforting atmosphere. Make sure to order the Wood Grilled Artichoke appetizer. 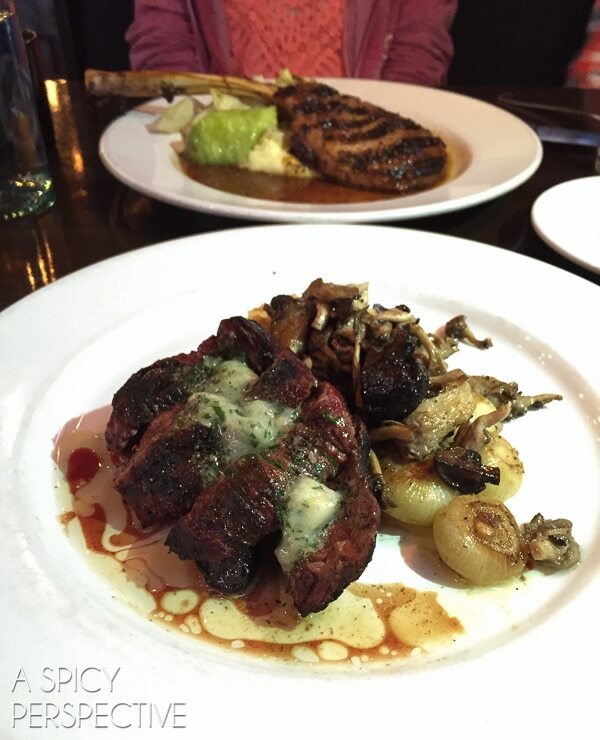 The Buffalo Bavette and Tomahawk Pork Chop were also serious standouts. 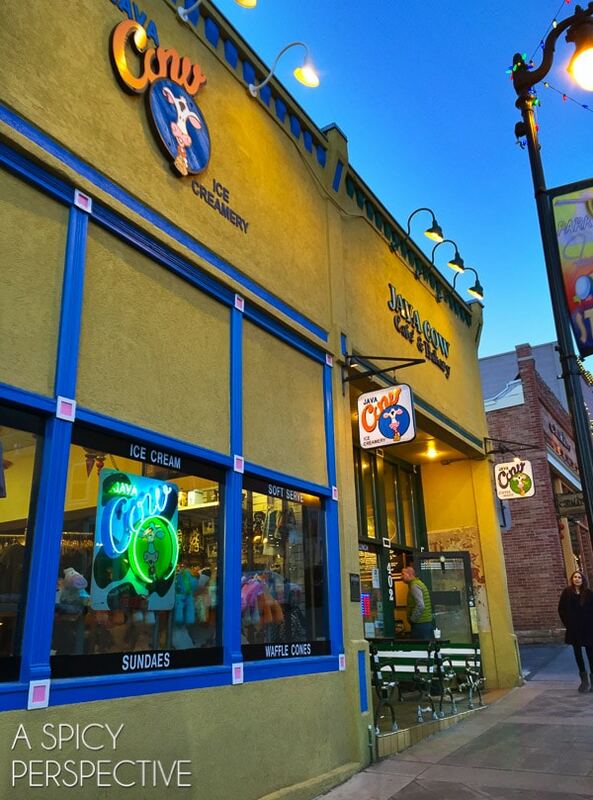 Java Cow – This quaint little coffee shop, bakery, and ice cream parlor is the perfect place to end a day of adventure. 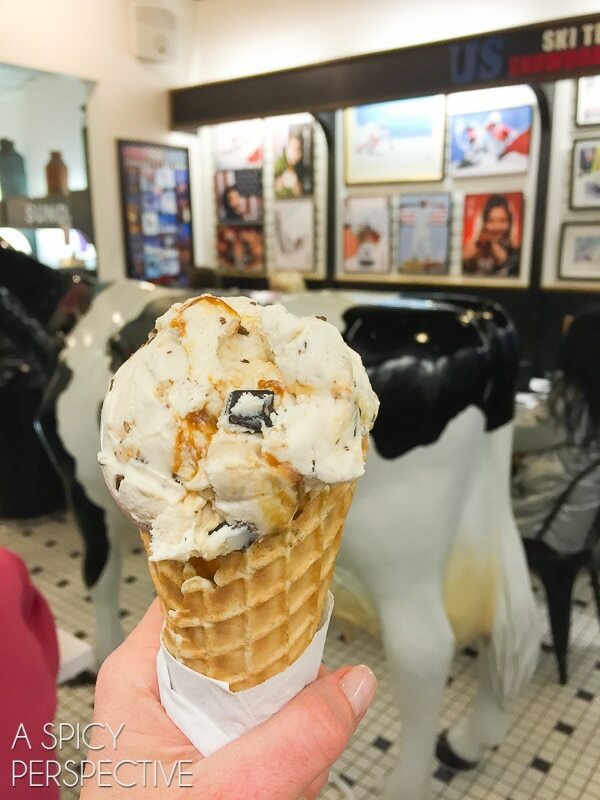 Try the signature flavor, a blend of chocolate chip ice cream with heath bar and homemade caramel sauce! I also want to mention that we stayed at the Lodges at Deer Valley which had a fantastic complementary breakfast every morning. 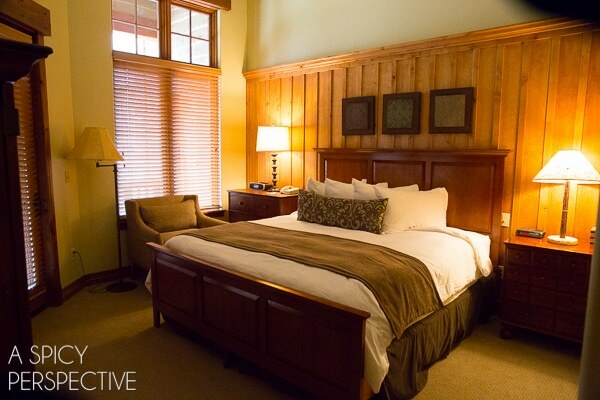 The lodges also provides complementary car service to downtown Park City so you don’t have to rent a car, heated pool and hot tub, fitness, daily kids activities, fresh cookies and hot chocolate for Apres-ski, and cozy clean high-end ski condos. Loved it! 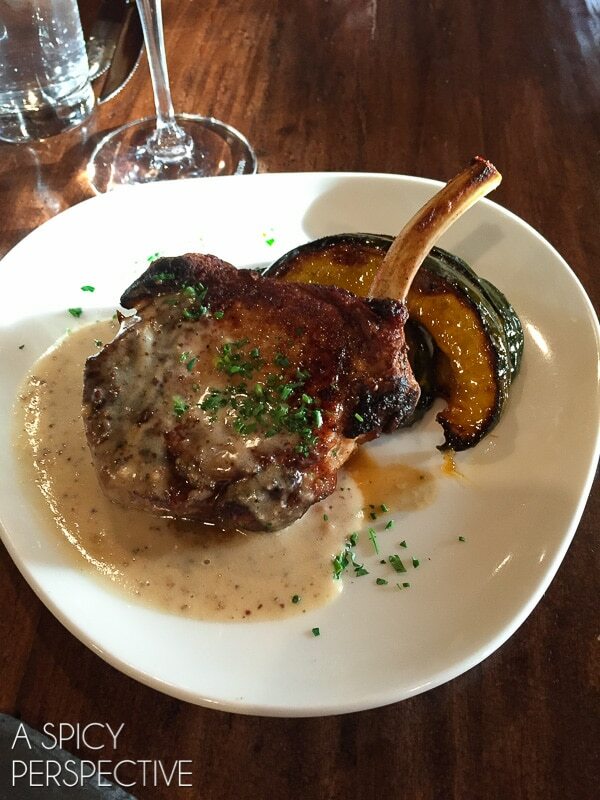 We realize we didn’t have the opportunity to dine at all the fabulous Restaurants in Park City, Utah. If we didn’t mention your favorite, tell us about it in the comments below! 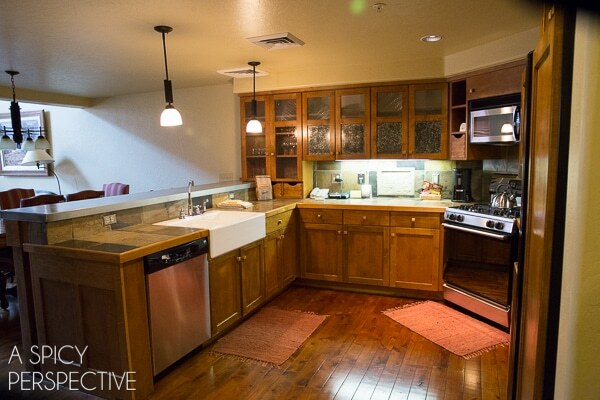 Disclosure: We were hosted by Visit Park City. All opinions are our own.